Burj Mohammed bin Rashid Tower ... stands tall. The Burj Mohammed Bin Rashid Tower in the UAE’s capital Abu Dhabi has been declared The Best Tall Building in the Middle East and Africa (MEA) by the Council on Tall Buildings and Urban Habitat (CTBUH) as part of its Annual Awards programme for 2015. As part of the programme, the CTBUH has announced the best tall buildings from four competing regions in the world, the Americas, Asia and Australia, Europe and MEA. The winners were selected from nominees representing a total of 33 countries. This year’s selection was the most competitive yet, with winners selected from a pool of 123 entries, which is up nearly 40 per cent from 2014, said the council, a leading resource for design, construction, and operation of tall buildings and future cities. The 382-m-tall, 92-floor tower was selected for blending its cultural and geographic context through its design and use, according to the jury, which appreciated that the tower’s undulating cladding creates a mirage effect that alludes to its desert ambience. A marketplace based on the traditional suq, with offerings ranging from modern luxury goods to regional artisanal crafts, helps integrate the tower to its surroundings, it said. 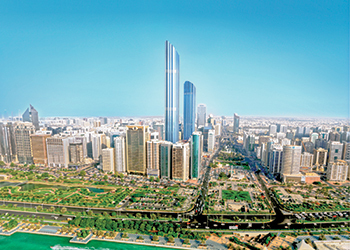 Al Hilal Bank Tower in Abu Dhabi was one of the finalists in the MEA category. The winners in the other categories are: One World Trade Center in New York, US (Americas); CapitaGreen in Singapore (Asia and Australia); and Bosco Verticale in Milan, Italy (Europe). An overall winner for the Best Tall Building Worldwide will be selected from these four winners, and announced at a dinner following the CTBUH 14th Annual Awards Symposium, to take place at the Illinois Institute of Technology, Chicago, US, on November 12. The symposium itself will feature an exciting series of presentations from the owners and architects of each building.